I always begin to get a bit concerned when anyone tells me not to worry, but I decided to listen anyway. He said there are zones inWyomingthat have left over tags and that we can actually buy leftover non-resident permits over the counter. The only issue I now had with this trip is that my buddy, who is perhaps the most ‘economical’ (I’m being kind here) man I ever met said that we would be hunting public land as he refused to pay an sort of trespass fee to access private land. I agreed and before I knew it I was checking into the Best Western hotel inGillette,Wyoming. 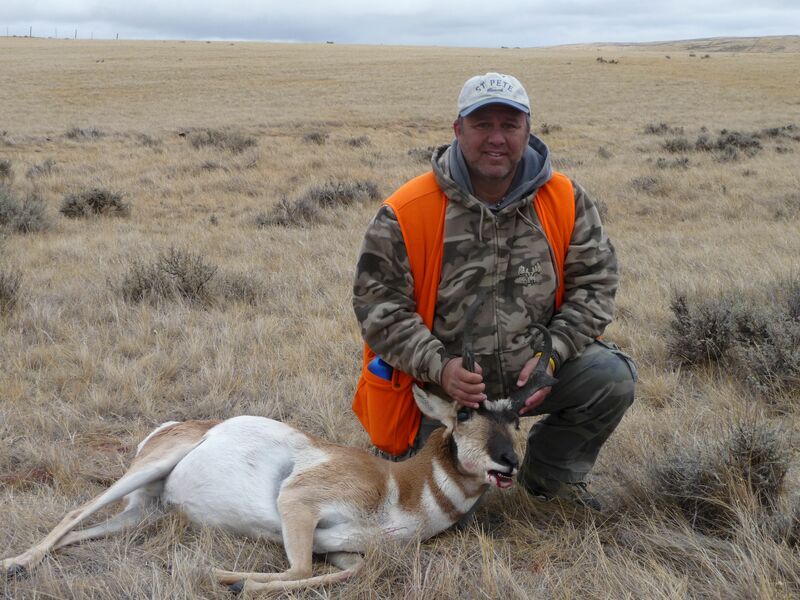 Planning is usually key when undertaking this type of hunt as the deadline for Pronghorn Antelope tags inWyomingis around Mid-March and depending on the zone you choose to hunt is not a guarantee as tags are drawn by a lottery system. I sometimes think I have a better chance of winning the Power Ball Lottery than ever getting the exact hunting time and zone I want. But this was a last minute adventure so I had to adapt. I was able to make the hotel reservations just two weeks out. My friend told me that certain zones had plenty of left over tags and that getting one would not be an issue, however the $270 dollar Antlered Pronghorn tag took me a bit by surprise, but I figured, since I’ve never done this type of hunt before, what the heck. Another possibility was to merely tag along and enjoy the beauty ofWyomingand just help out my buddy. We went over to the Gillette visitor’s center where aWyomingwildlife biologist was available to answer all our questions as well as those of about a dozen or more other hunters. Many of the hunters were inquiring about a list of landowners who are willing to allow you to hunt their land for a fee. This trespass fee can range from a hundred to possibly a thousand dollars depending upon the size of the hunting area and the availability of game. If you have a few extra dollars to spend, this is not the worst idea, as after opening day many animals tend to move away from the public lands to the less pressured private land. But again, my buddy is thrifty and told me he had an ace in the hole, so to speak. This little advantage he spoke of was also mentioned by the a game warden and several other hunters who where enquiring where to buy a chip that loads into a Garmin GPS and indicates by color all the public lands available for hunting. It also has the names of all the landowners of the surrounding land. This is an amazing piece of technology and actually was the key to our hunt. I’ll talk more about this device in a future article, as it deserves one of its own. As we left the visitor’s center the Biologist did suggest that due to the very dry conditions that if we find water, we will find Pronghorn Antelope. Sometimes the problem is not spotting the Antelope, but how to you get close enough without them spotting you! The day before opening day we began to do a bit of scouting. I had never done this type of hunting before and was eager to get started. 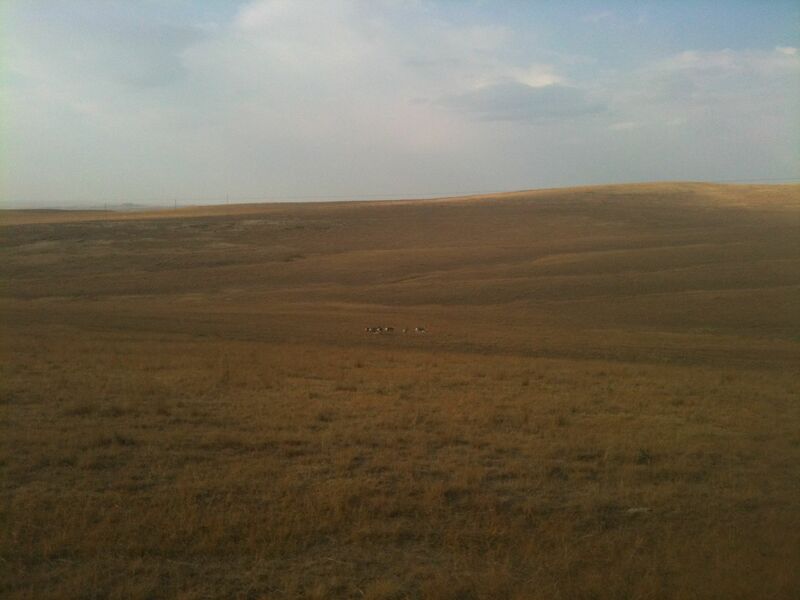 Basically it consisted of driving up and back on the gravel roads with binoculars and searching for Pronghorn Antelope. Now, I’m sure there are dozens of methods to scout Pronghorn Antelope but remember, I’m writing this article as a first timer and sharing with you the easiest methods to get started with minimal preparation, just the same way I did. There were plenty of animals however many of them seemed to be congregated on the private lands. I’m sure much of this was due to the dry conditions and the ranchers having installed ponds and cisterns for their cattle. It was the night before opening day and I had still not decided whether or not to invest in a $270 dollar pronghorn permit when I received an email from theWyomingwildlife biologist who I had become very friendly with. She mentioned that I could buy a Doe/Fawn Antelope permit for about 35 bucks! I was sold. Since I was there more for the adventure and wasn’t out for a trophy this was a perfect way to experience Antelope hunting on the cheap and if I didn’t get an animal or chose not to harvest one, I was merely out the cost of a dinner! If you are like me and give a large portion of any animals you harvest to local food pantries and are not after trophies but love the chase, this is the perfect way to go! The weather had been hot and very dry and although animals were present they always seemed to be just out of reach. The weather was unseasonably warm at 84 degrees in the first week of October. The weather now had done a complete reversal and within 24 hours Gillette, Wyoming went from the 80’s to the 30’s with occasional freezing rain, just they way we like it! This change and the fact it was now 4 days into the Pronghorn Antelope season had thinned out the number of hunters but also scattered the Antelope as well. 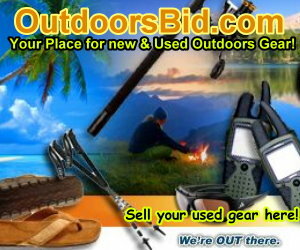 It was time to fully use the Hunter’s map GPS chip to its fullest and we decided to explore. We found one square mile of public land that had a public road leading to it and decided to give it look. There sitting on top of small ridge was a beautiful buck! To make a long story short and save material for another article, my buddy harvested the Pronghorn with a short 80 yard shot. I decided to forego my chance at a doe and thus ended my first Wyoming Antelope hunt. 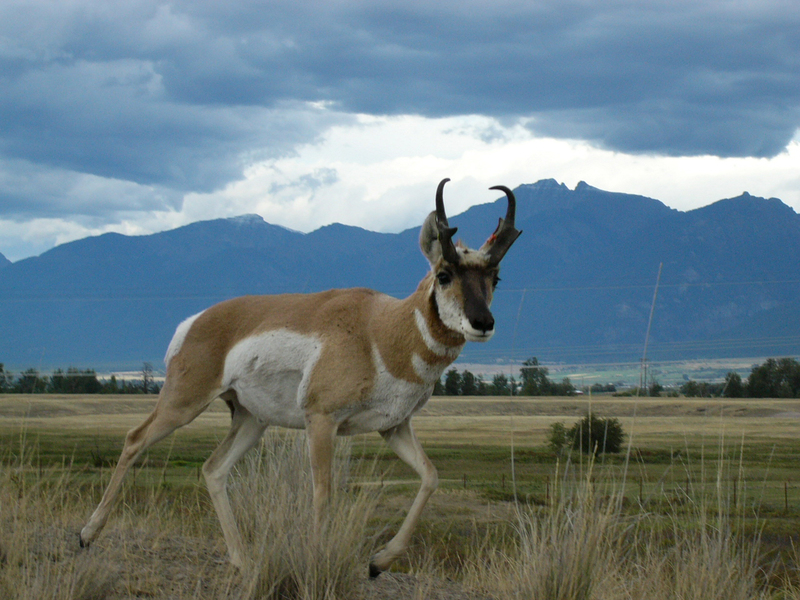 This article was written to demonstrate that even newer hunters can have an opportunity to go after Wyoming Pronghorn Antelope. You need not spend thousands of dollars on a guided hunt, or even pay a substantial license fee, unless you feel the need to harvest that trophy buck. If you just want to experience some great hunting, meet some new people and see some of the most beautiful areas that one can imagine, it is within your grasp. The area aroundGillette,Wyomingis noted for the numbers of Pronghorn Antelope and Mule Deer, and if you miss the deadline for a tag you can look into the availability of leftover licenses. Don’t forget that if cost is a concern you may even be able to purchase a Doe/Fawn tag for considerably less. The only thing that is mandatory is that you get proficient taking long shots with your rifle, as although we knocked our beast down within 80yds, shots of 150 to 300 yards are common. This is most of what you need to know to get started, so don’t sit back and read about my adventure, get out there and create your own! Well written and accurate! Wish everyone who was planning an eastern Wyoming antelope hunt would read this! thanks for all the help in making this trip so much fun!